“I only ask to be free. The butterflies are free. Mankind will surely not deny to [me] what it concedes to the butterflies!” Charles Dickens, Bleak House. If you’re not familiar with Bleak House, which is one of the most complex—and one of the most rewarding—of Dickens’ novels, perhaps you’ve heard this quotation in Butterflies Are Free, a 1972 film (based on a play by Leonard Gershe) about a young blind man, Don (Edward Albert), who rents his own apartment to become less dependent on his overprotective mother (Eileen Heckart). As she still struggles for control, he meets his neighbor, Jill (Goldie Hawn), a “free spirit” who inspires him to become his own person. After she tells him that the Dickens’ line is her favorite quotation, he writes a song about his spirit learning to fly. For several years, long before I was diagnosed with and treated for uterine (endometrial) cancer, I have thought of the butterfly as a personal spiritual symbol. Many cultures and traditions turn to this beautiful winged creature to symbolize the soul and other essential aspects of life, such as metamorphosis. Few things top the list of shattering changes more than potentially life-threatening illness. Yet, even when it is serious, illness is only part of our life experience. True, it sometimes commands center stage. But in the next act—or even in the next scene—some other, deeper aspect of who we are takes its star turn. By no means do I intend to diminish the supreme challenges faced by those who are debilitated by illness or injury or to dismiss uncaringly the anguish of those who have lost loved ones to terminal disease or early death. But the message of the butterfly is available to all, even to those who suffer. Because even if we sprout wings that don’t have the strength to free us from the pain and limitation of earthly life, they can still help our spirits to soar. If we don’t have the strength even for that, our spiritual wings can at least help us float gently on the soft winds of the universe as it continues on its infinite course, reminding us that we are part of all that is, ever was, or ever will be. Having passed through the metamorphosis of serious illness, I think back to decisions I’ve made that both hurt me and helped me arrive at the place I now find myself. And I’ve had to face that many of the external markers of identity are now lost to time—reproductive status (first in menopause and now in the absence of organs), the joys and responsibilities of young motherhood (my only child is now a man), marriage and name change (one divorce behind me and a total of three last names), the comradeship of friends and colleagues (many losses and gains over the years), the pride and sustenance of career and income (gone and none at present), and so on. These things have shifted so significantly that at times I feel adrift in the cosmos, unanchored to earth or to anything that feels comfortable or familiar. But these moments pass. And I realize that what remains after pseudo-identity is irrevocably altered is the emergence of what lies beneath and within, which can be surprising. Having lost so much, and having spent so much time alone confronting my very existence, I nevertheless have experienced an integration of the essential aspects of myself with how I navigate external life. I discussed some of these things in the March 14, 2014 post, Reading & Writing as Therapy. The message was simply this: Find, or rediscover, what you love. This tells you who you are. It is my hope for all who face grave or passing illness, permanent or temporary loss, and terrible loneliness or even somber solitude that they can find their butterfly selves by turning inward to where they can see that the outward path is visible but ephemeral—and also by connecting with similarly affected, like-minded others, who can not only share their experience, but enter into it with them. Just a few thoughts for the last day of March as I prepare to take The Patient Path in new directions. 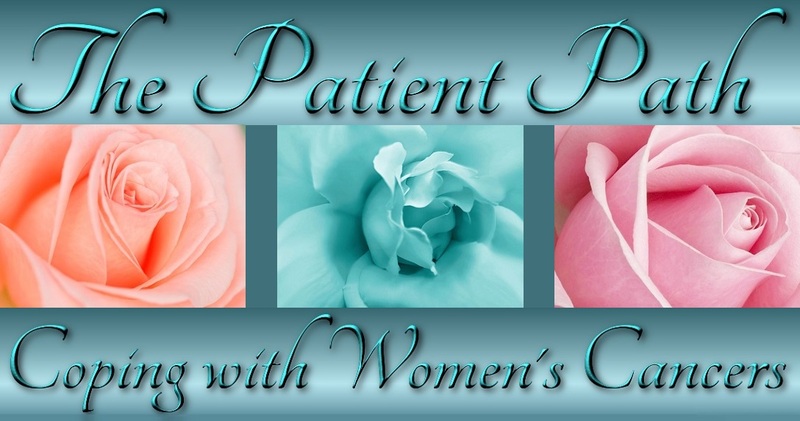 You may notice that the URL for the site is thepatientpath.net since I have just registered this domain name. I attempted to register thepatientpath.com, but a domain-name reseller had already snatched it up, I believe because visits to the site have increased recently. I should have acted sooner, a lesson I′m still learning—not only about such things as domain names, but about getting certain problems, such as postmenopausal bleeding, checked immediately. Take it from me, ladies, and please reread the important November 20, 2013 post Uterine Cancer Risk Factors. As we go forward, we will be addressing health topics in addition to uterine (endometrial) cancer, and some have already been written about in earlier posts. All topics will deal with health, healing, and well-being on various levels. I also hope that readers will feel free to comment and share their stories. In the meantime, I plan to enhance the resources sections of the blog for the purpose of self-education and information gathering so that we can all continue to learn how to be the most important members of our own healthcare teams—and the stars of our own lives. Thanks as always, Mom. Love . . .